Twitter's value depends heavily on your finding useful people to follow. So how do you locate the leaders in your profession? Use these easy steps to success. With generic names, like a "John Smith," you might have the opposite problem: You'll get too many results (middle initials might help). Celebrities and luminaries in the business world — like a Jack Welch — usually come up pretty easily, however. You can then use Twitter's main search tool to search for keywords related to your industry (and you can see who is tweeting them), says Caroline Dangson (@carolinedangson), an IDC research analyst. 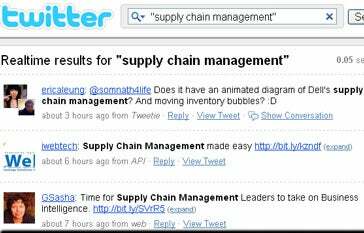 On Twitter's advanced search page, if you perform a search for a business keyword of interest — say, "supply chain management" — you might find some interesting people discussing the topic. Once you find some colleagues and thought leaders to follow, you should look at who they are following, too, says Jeremiah Owyang (@jowyang), a senior Forrester analyst. The most popular is WeFollow.com, which was started by Kevin Rose (@kevinrose), the founder of digg, a social networking site whose users aggregate and vote on news stories. WeFollow sorts Twitter users into popular categories, such as media, technology, business and entrepreneur. On the site's right column, you can see the most popular categories. To view the entire directory, you must click on "more Twitter tags." It might contain ones that are more relevant to your industry.